Here we are in Adjala-Tosorontio, a township at a crossroads and in turmoil. Well, the all-candidates’ meeting last Wednesday at the Tosorontio Central Public School was somewhat in turmoil, with jibes – for the most part good natured – being exchanged from the audience to the platform, and fingers – mostly accusatory – being pointed from the platform to the audience. Issues raised ranged from development in Everett and Colgan, costs of new wells needed for various development projects, high water and sewer rates, possible mandatory hookup to municipal systems, high-speed internet, recreation services, council’s responsiveness or otherwise to residents, projects started and not finished or not needed. Residents and candidates spoke their minds, and that’s a good thing. Not so great is the turmoil that has by all accounts been a feature of the last term of council, presided over by departing mayor Mary Small Brett, and punctuated by a series of flash-points – approval of the Nelson Aggregate gravel pit despite highly organized resident opposition; an Ontario Provincial Police investigation of post-retirement benefits to age 80 for staff that resulted in a roll-back to age 65; and three integrity commission reports on the behaviour of two members of council. There’s a permanent 5-2 split on council, and the two in the minority were the targets of the integrity reports. Two of the investigations – one against Councillor Bob Meadows, the other against Councillor Floyd Pinto – were triggered by complaints by planning commissioner Jacquie Tschekalin that she had been treated disrespectfully and her professional reputation had been impugned. Commissioner Harold Elston, a Collingwood lawyer, cleared Meadows but came down hard on Pinto. As a result, Deputy Mayor Doug Little who, after first getting a motion passed by council to reprimand Pinto, returned to the attack in September and got approval of a motion to suspend Pinto’s salary for the remainder of his term. Elston’s reports reveal Meadows and Pinto have taken similar positions in opposition to various development projects, at the council table and before the Ontario Municipal Board where they appeared (as residents) to oppose the Nelson gravel pit. Elston, who must have led a sheltered life, comments that it’s “unusual” that councillors would argue positions contrary to those held by the majority on council. It would seem that he found Pinto’s offence more serious than Meadows’ because of a blog in which the councillor has reported to the public on council matters in a detailed and continuing manner. Elston found the commentary malicious. I disagree. Reading Pinto’s blogs – examples of which are appended to Elston’s report – I sought in vain for personal attacks. I find the blogs focus on important issues on a wide range of subjects relating to democratic procedures. Certainly, they are lacking in deference. I consider this to be refreshing and commendable. Politicians all too often allow themselves to be bamboozled by ‘experts’ when it is their duty to evaluate the advice they receive on the basis of experience and common sense. Which brings us to the crossroads – where things are at for this municipality that runs down the west side of Simcoe County south of Highway 90. It takes 80 minutes to get into Toronto from Everett – 20 minutes to the 400 and then an hour to say, Yonge and Eglinton. A tiring commute, twice a day. But do-able. Developers and pro-growth members of Adjala-Tosorontio council see salvation in those commuters. Others see existing residents edged out by bedroom communities as the servicing needs of the new arrivals drive up taxes and other costs. In Ontario’s Places to Grow legislation, and the subsequent Amendment 1 that eased restrictions on growth in Simcoe County, the plan for Adjala-Tosorontio has been to remain as a rural area. Growth in Simcoe County as elsewhere in the Greater Golden Horseshoe is to be directed to settlement areas that offer municipal water and wastewater systems, and growth in settlement areas served by other forms of water and wastewater services is to be discouraged. This reflects the findings of the Walkerton Commission: municipal services cannot be delivered economically in small settlements – and groundwater is no longer a given. Places to Grow didn’t sit well with Adjala-Tosorontio, headed for many years by farmer Tom Walsh and for the last term by Small Brett. It seems the planned solution to the province’s attempt to rein in growth was for the township to go in completely in the opposite direction, expand settlement areas, add to water and wastewater services and declare itself open for business. In 2013, Official Plan Amendment (OPA) 15 was approved to expand Everett’s boundaries and facilitate development in the village. The Province of Ontario and the County of Simcoe oppose OPA 15. Questioning the value of growth is a novel idea in Simcoe County (Springwater’s current council being an exception). No matter that it has been repeatedly demonstrated that residential development is a burden, not a boon, to existing residents, because not all initial costs of servicing are covered by development charges, and neither are future operational and replacement costs. It is essential to have commercial and industrial development to balance the residential – but those are far harder for developers to deliver; and they’re not likely to, unless the host municipality insists. But growth is the mantra. “Development is coming,” said deputy mayoral candidate George Gaffiero, a landscaper and newcomer to the political arena. He advocates readying infrastructure for growth down the road. “Developer!” came the cry from the audience. “No, no, no, no, it doesn’t come from the developer,” Meadows said. “That’s what you guys have been saying all night,” the cry came back. “Exactly, that’s what they’ve been saying all night but it’s not the truth, it’s not the truth,” Meadows replied. These are the issues that have been thrashed out in a war of fliers across the municipality. After Concerned Citizens of Adjala-Tosorontio (CCAT, the group that hosted last Wednesday’s all-candidates’ meeting) put out a ‘Just the Facts’ flier on yellow paper, an anonymous and contradictory ‘Just the Facts’ flier on white paper appeared. A resident detailed to the meeting an email she had sent to members of council asking who was the author of the white paper, which looked as if it had been written by someone associated with the township – a councillor or employee. In reply, Little accused her of making “insinuations” about township staff. After another resident complained to the clerk that the new third-party advertising rules do not permit anonymous material, Little added his name to the white paper. On Wednesday, the resident raised the issue of his initial failure to acknowledge authorship, and for some reason that wasn’t clear, Little accused her once again of attacking staff. In 2013, AWARE Simcoe engaged in a lengthy process to create a vision for Simcoe County – not based on growth but based instead on the carrying capacity of the land, agricultural prosperity and a steady-state economy structured to provide full employment and a good life for residents. It’s going to take a new breed of politicians to change course. It won’t be easy. 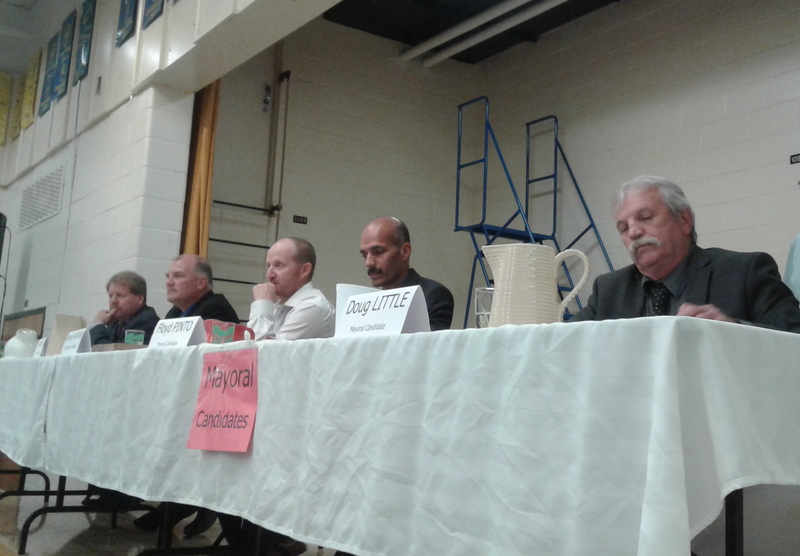 The all-candidates’ meeting showed that Adjala-Tosorontio voters have a distinct choice for every seat on council. In this, they are ahead of the game. Excellent article. Outlines the macro issues facing Simcoe County , too. A very excellent article! Kate Harries is obviously a professional writer. I sure wish I could write like that!! I think AWARE is very fortunate to have the benefit of Kate’s support. BTW, for those who may be interested, according to Adj-Tos Fire Chief Ralph Snyder, CCAT’s meeting in Everett last week attracted about 250 people!! A capacity crowd! Who ever said that politics in Adjala-Tosorontio is boring? I agree with you Doug, Kate is a invaluable member of the AWARE Simcoe team! Thank you for your accurate article on CCAT Inc.’s All Candidates Meeting of October 10 , 2018. It is very obvious that the voters of Adj. Tos. have two very clear directions when voting. One is vote for the candidates that have been on council for many years, some for a decade or more. You can’t expect a lot of changes coming from this group. Things, such as the white flyer that came out without a name, is only one of many examples as to how things have not been tranparent when it comes to the citizens of the township. The other direction to go is by voting in a number of new council members that are now running as candidates in various wards, along with new candidates running in positions of deputy mayor and mayor. Many of these candidates spoke of a more positive way of doing council business – including real transparency, new initiatives and ideas, and honest leadership that will look out for the concerns of the citizens and their tax dollars. If Adjala Tosorontio is in fact fed up with the way coy Ik has been run over the years, then the direction is an obvious vote for change. When most council votes are decided by a 5-2 vote, and those 5 votes are consistently put forth by the same 5 councillors, there is absolutely no indication that this is a council that has worked well together. Of the 5 who vote for an issue, with the exceotion of one, council members have been on council first least2 terms. Some have been in council for many terms. Acting President of CCAT Inc. Thank you for writing such an insightful article that truly sums up the issues facing our beautiful township. I fully support, Pinto and Meadows.